Every day, people who are desperate for help learning English come to us looking tired from working two jobs and caring for their families. They are so hopeful that we can help them learn the English they need to schedule a doctor’s appointment, talk to their child’s teacher, understand their phone bill, fill out a job application, and speak to their American neighbors and co-workers. With help from a Volunteer English Program tutor, they achieve these goals and more. VEP has more than 25 years of successful experience teaching English to adult immigrants and refugees in our community. We serve over 200 adults from more than 40 countries. Our program has earned numerous awards and commendations for successfully serving thousands of people who can now participate in and give back to the communities we share. But nothing illustrates the power of our program more than the students themselves. In the coming weeks, we will post students’ letters which tell of their transformation thanks to our one-to-one tutoring model. Please watch for each student testimonial, telling about the impact of the Volunteer English Program. In the face of decreasing and disappearing funding for the the work of non-profits, VEP is in the midst of our annual fundraising appeal. Our waiting list frequently climbs to more than 60 people. We need funds to recruit and train tutors, intake and assess students, purchase textbooks and materials, match tutors and students, and coach pairs throughout the time they work together. If you would like to make a donation, please click here or visit our website at www.volunteerenglish.org. It is our donors’ generosity which truly sustains the power of our program. Thank you! This post was submitted by long-term tutor and VEP Board Member, Fred Crotchfelt. He currently has two students, one from Colombia and one from China. In addition, Fred leads the VEP Speakers Bureau. What I do with my student during sessions? This is a question I am frequently asked when I speak about the Volunteer English Program. There are many methods to tutor our students. One of the benefits of our one-on-one tutorial model is that we can tailor the training to the individual, as opposed to having to fit one method of teaching to a whole classroom of students, all with different needs. Fred with his students, Gustavo on the left and Jerry on the right. In the early stages of my tutor/student relationship we started with the workbooks provided by the VEP office, in addition to general conversation and learning about the person him/herself. It’s really part of the “feeling out” part of the process. That’s the way we tutors find out about our student’s level of competence of English and what the student wants (or needs) to get out of the process. In my case, both of my students wanted to work beyond the workbooks after a couple of months since it soon became apparent that the real need was conversation . . . to be able to go out in public and communicate in English. I believe some students stop the tutorial process and leave because they get bored if all they are doing is sitting practicing exercises in a book. The books are important to establish the base learning elements . . . but it’s definitely not all the whole process is about. • Visit his manufacturing plant – I make him explain the how the machinery works, how things get put together, who the customers are, and any other subject which gets him talking in English. I had him introduce me to his boss. • We have walked around in West Chester and gone to the Exton Mall – we talk about whatever we see or pass. • We’ll take a drive in the car and discuss what we see. • Both have accompanied me on a speaking engagement. I’d be interested in learning what other tutors do with their students in addition to the more formal studies through workbooks and in-session tutoring. Let us know! –Fred C.
Editor’s note: VEP tutors, please join the conversation. Call Patty at 610-918-8222 if you’d like to share your tutoring experience here on the blog. Thanks for all you do! Jihong and her husband, Bob, at her ceremony. 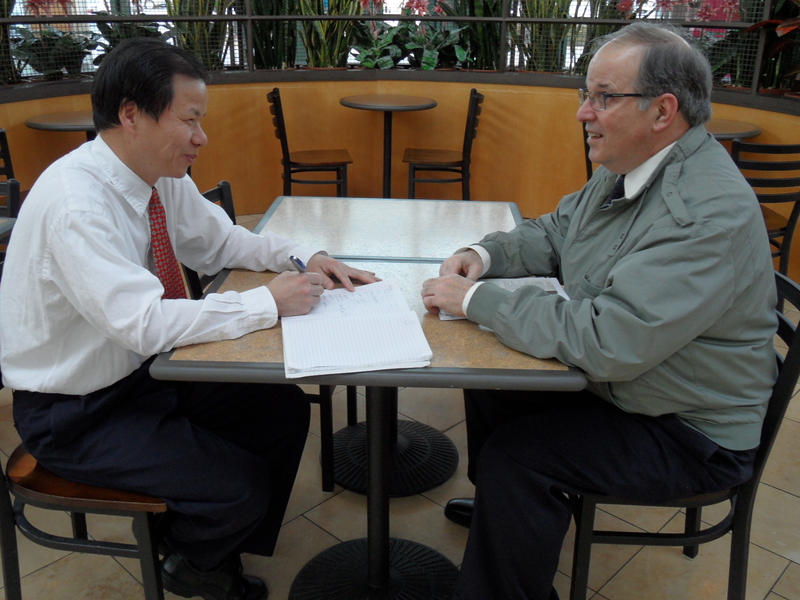 On Monday, November 26, 2012, my student, Jihong Korbonits, became a naturalized citizen of the United States of America. This journey began when Jihong came to the USA from China in February 2009 on a fiancee visa to marry her husband, Bob Korbonits. Jihong was a professor of Physics and Math at a university in China. Traveling with Jihong was her daughter, Yao, who enrolled at Henderson High School. Jihong contacted VEP soon after arriving and began learning English with her tutor from VEP and also taking classes at OIC. After a few months, her tutor left to teach in Japan, and I was assigned as her new tutor. Jihong was eager to learn and worked very hard. She soon knew enough English to apply to Wegman’s Grocery Store where she now works. Her daughter excelled at Henderson and is a sophomore in chemical engineering at Villanova University. Both had arrived speaking virtually no English. Jihong continues to refine her knowledge of English and can even use idioms and joke with her co-workers. When her daughter finishes college, Jihong hopes to return to school in order to be certified to teach in the US. All of this in three years! Jihong was one of about 50 immigrants being sworn in at the US Citizenship and Immigration Services located at 1600 Callowhill in Philadelphia. The new citizens represented 34 different countries. We were all shown a video about the United States and another video where President Obama spoke to the new citizens. We sang the Star Spangled Banner and recited the Pledge of Allegiance. The ceremony was very moving, and a woman sitting next to me, who had been sworn in six months ago, expressed her heartfelt, sincere gratitude to the people who volunteer to help immigrants learn English. She had the unique experience that her tutor, who was from Hungary, was naturalized at the very same ceremony that she was. I assume that the tutor already spoke English when she arrived. At this ceremony, my seat-mate’s 77 year-old father-in-law, who had never imagined he would become a citizen, was also being naturalized. He has been here for 20 years but had never learned English as he lived in a community of Colombians in Queens. With his family’s encouragement, learn he did; and he cried as he received his certificate and so did the rest of us! valuable other cultures are to our lives. Editor’s note: If you are moved to become an English tutor with the Volunteer English Program, please call us at 610-918-8222, or visit our website, www.volunteerenglish.org. Jihong is one of several VEP students who met the goal of citizenship this year. Congratulations! Recent achievements: As a project leader at a King of Prussia-based research and development firm, Shui P. takes satisfaction in his work. In the thirty projects brought to the commercial market under his aegis, Shui P. takes extra satisfaction in six patents and four more pending. Additionally, with his fifteen peer-reviewed publications, these are not what he sees as the fruition of his life’s goals. “Private charity organizations and NGO’s can assist Haiti, but they are limited and operate on a smaller scale than do national governments. As for me, I am helping my son raise enough funds for a well in the village Cherival—where 1000 people now share one single well. 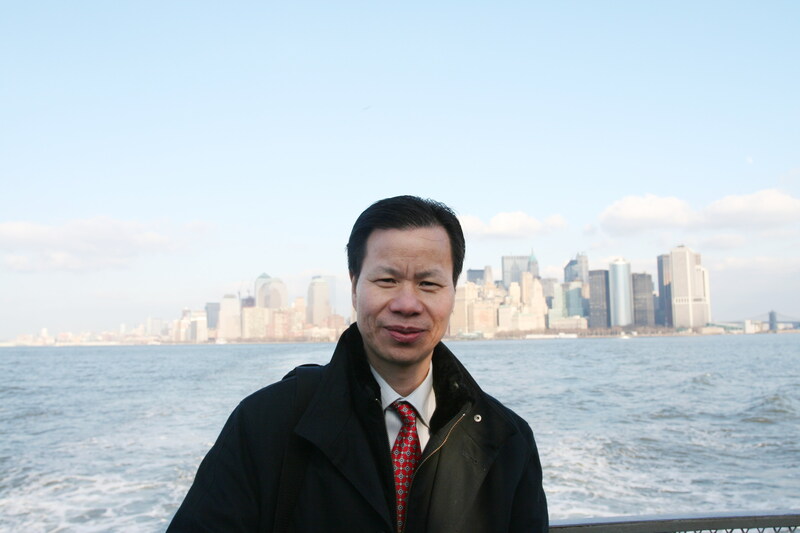 Despite his position as a University Instructor of Quantum Chemistry in Wuhan, Shui P. moved to the United States in 2003 for, “the taste of democracy.” In 2009, he came to VEP seeking help with pronunciation and listening, and soon he began his tutoring with Brett Swailes. Now they are members of the VEP Speaker Bureau. Today, he willingly speaks to prospective tutors, in compelling expression of the power of volunteering. In his spare time, Shui P. enjoys chess, bridge, and ping-pong. He and his tutor, Brett Swailes, now see each other as close friends. Congratulations and Thanks to Shui P. Zhu!